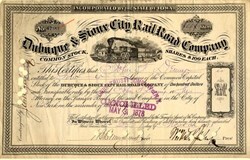 Beautiful certificate from the Dubuque & Sioux City Rail Road Company issued in 1878. This historic document has an ornate border around it with a vignette of a steam locomotive. This item has the signatures of the Company's President and Secretary and is over 130 years old. In 1867 the Illinois Central, which by then progressed beyond Galena and across the Mississippi to Dubuque, Iowa, leased the Dubuque & Sioux City Railroad, extending its western line to Iowa Falls. This line reached Sioux City in 1870.